A Colombian acrobat has brought the dizzying flips and mid-air spins of Spider-Man to the streets of Bogota, in a perilous act performed from a highway bridge. Web slinging comic book hero Spider-Man is known for targeting thieves in New York, but Spidey’s ‘mission’ in the Colombian capital centers on roadside entertainment – and possibly collecting some loose change from passing motorists. Forget Peter Parker. In this Colombian incarnation the man behind the mask goes by the name of Freddy Duque. 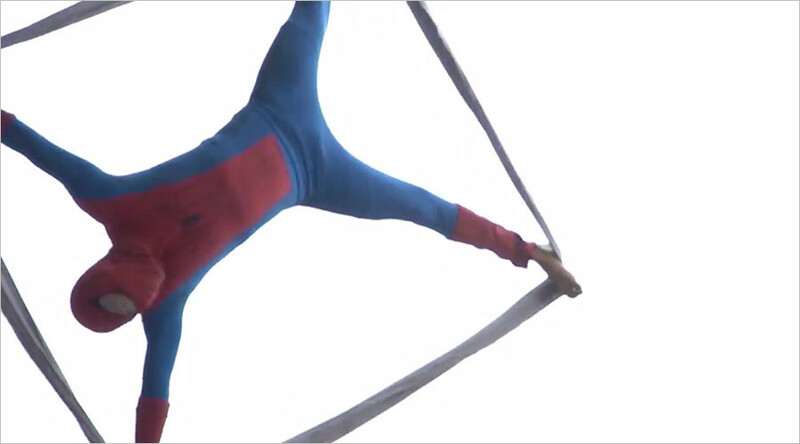 He has been filmed putting his physical wellbeing on the line by dangling above busy junctions and pavements using nothing but a length of aerial silk. “I am the Colombian Spider-Man. I’ve been doing the Spiderman for three years in Medellin and Bogota,” Duque said. The ‘superhero’ uses online mapping tools not to seek out devious villains, rather to find suitable places to perform. Duque caught the superhero bug while performing in the city of Popayan, where he said he first donned the famous red suit and initially earned the equivalent of just US$0.67. Recently, on better days, he says he earns as much as $25 from a single car.